I recently was lucky enough to receive a couple of amazing products to try out and share with you. One is a polish brand I have used before and love - Pomegranate Nail Lacquer. I also received a cell phone case for the iPhone 4 / 4s from Cellairis. This is not normally a product I would share with you, but I am completely excited about this. First let me tell you about the polish and the case. 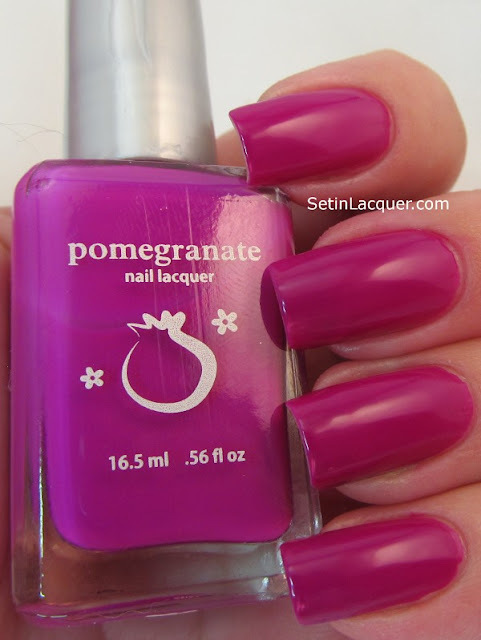 Pomegranate is a wonderful polish that applies well and has depth and dimension. One of my favorite polishes of all time is Pomegranate Fairy Berry. But Book of Spells is pretty awesome too. 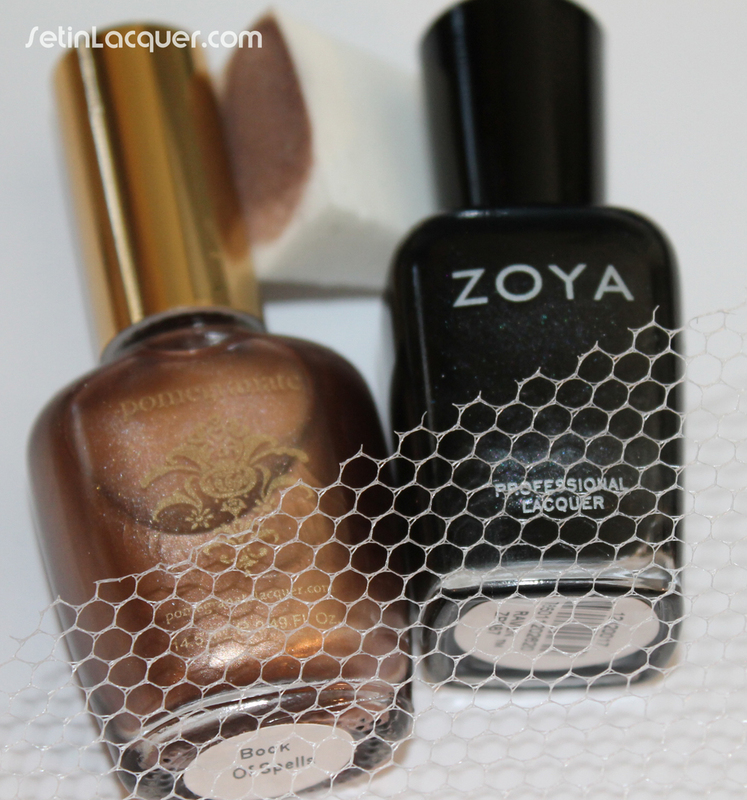 It is an phenomenal shimmery bronze shade that is perfect on its own or in nail art. The Cellairis® Sugar Shack™ case was a delight. I have to admit I normally buy bargain cases but this may have just changed my outlook. The case was a dream to put on my iPhone 4s. It snapped together easily and fit my phone like a glove. The bling is mostly a bronze shade but the glitz changes from a deep bronze to a gold shade. It can be purchased at Cellairis.com for $34.99. It doesn't get any sweeter than the Cellairis® Sugar Shack™. This two-piece, glittery iPhone protective case not only comes in your favorite flavors but is dipped in sprinkles that bling. Now for the nail art looks! 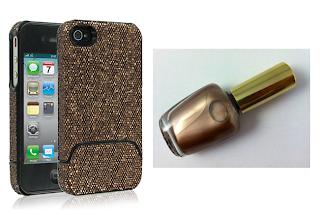 The first one is a "snakeskin" mani. I used Pomegranate Book of Spells, and Zoya Raven for this look. To get the design I sponged over a netting material and I need to practice a bit more on this look. You can see the material below. For the second look I used Book of Spells with a gradient of Zoya Raven. Then I added accent dots to finish it off. This is the netting I used for the snakeskin effect. The materials I used for the designs. 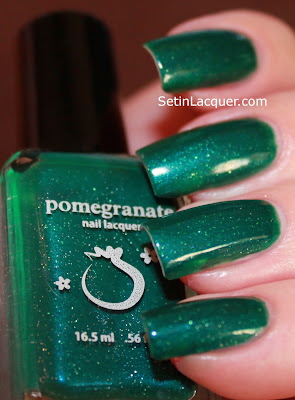 I am excited to be able to share these gorgeous Pomegranate Nail Lacquers from the Royal Fairy Tale Collection with you. I received Fairy Berry and Prince Charmer and I couldn't wait to try them. The colors in the bottles were amazing. And they were even more phenomenal on my nails. One of them has moved to my top five polishes ever! Prince Charmer - is a light lavender cream polish. Excellent application and a stunning, yet soft shade. This is two coats of supreme bliss. Now for the one that soared to the top of my list. 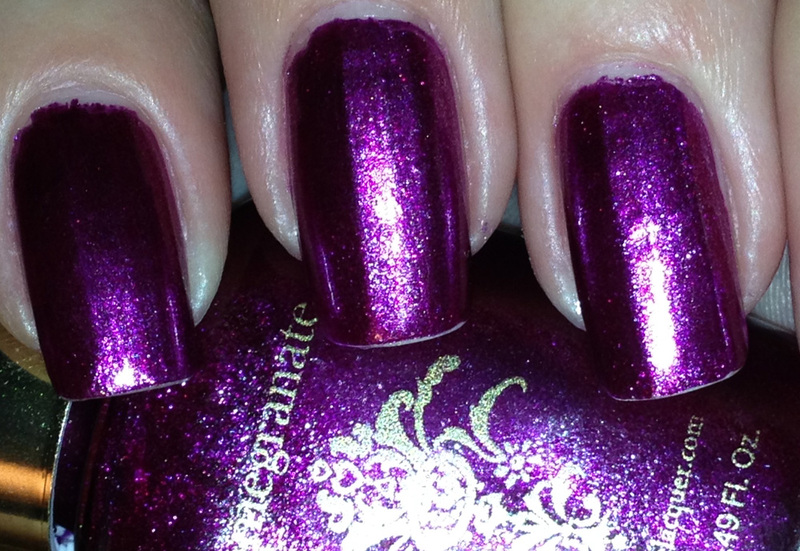 Fairy Berry - is a stunning berry/purple shimmer polish. I am sure you are asking how it is berry, yet purple. When I swatched it last night I took photos of a vivid, rich berry polish that was infused with glorious shimmer. I even posted the photo on my Facebook page. When I got to work today I looked at my nails and realized it was a magnificent purple. I didn't want to mislead anyone so I immediately took the photo off of my Facebook page. When I got home I tried to capture the wonderful purple essence of the polish. It had transformed on me again to a gorgeous berry shade. 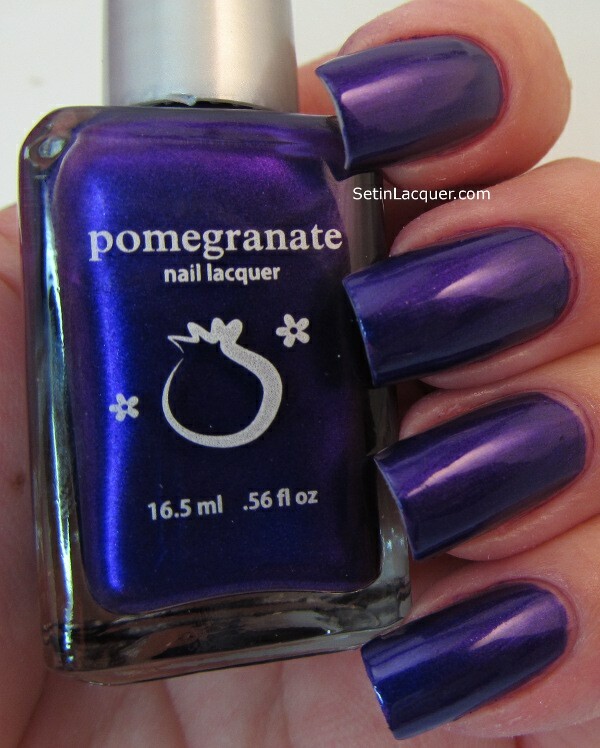 So, depending on the lighting the polish is either a berry or a purple shade. I did manage to snag a glimpse of the purple with my cell phone. While not a quality photo it does so the amazing transformation. This is only one coat! Can you believe this is the same polish? Now you can see why it made my top five polish list. 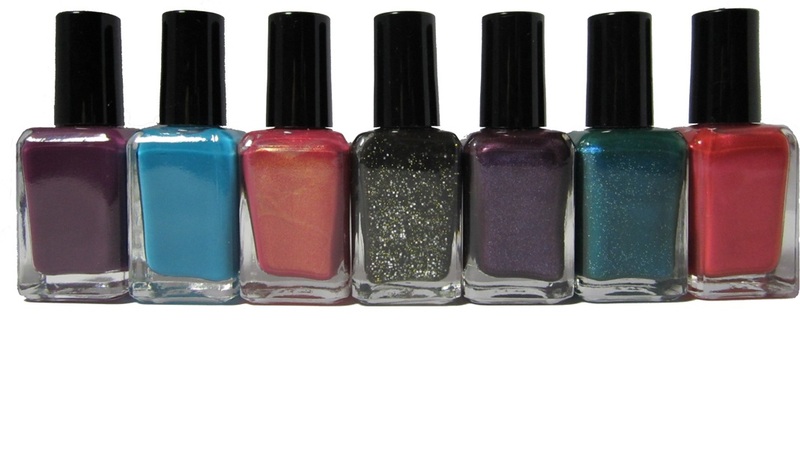 I am definitely going to be adding the rest of this collection to my polish stash. 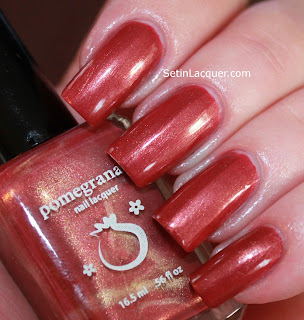 Make sure to follow Pomegranate Nail Lacquer on Facebook to keep up with their newest collections and specials. I received a new to me nail polish to share with you. 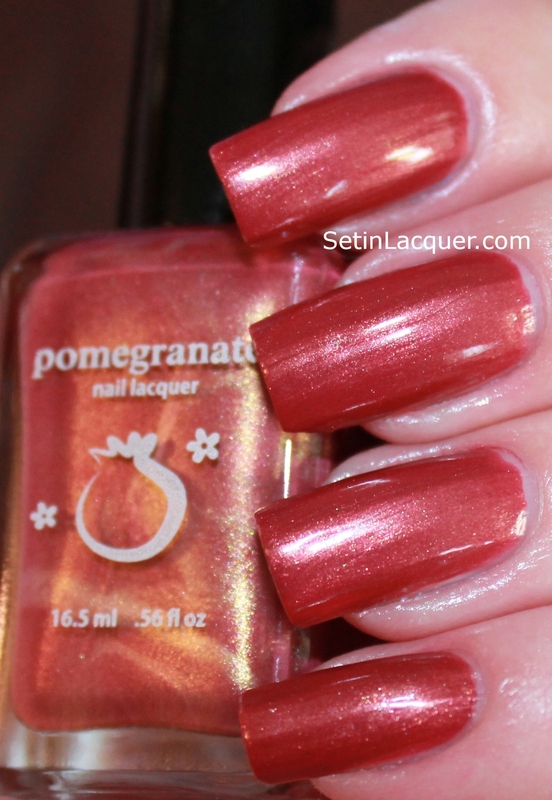 Pomegranate Nail Lacquer has some gorgeous shades. I have three for you today. 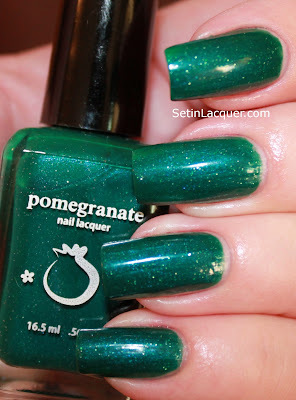 Pomegranate Lacquer have some beautiful colors that reflect something for everyone. I found that it applies wonderfully. The first coat was smooth and dried quickly. I used three coats for these swatches. I almost always use three coats as I like complete opacity. Two coats would have been sufficient though. It has a wonderful formula. The only thing I noticed about the formula is the odor is stronger than some polishes. But not so much that I wouldn't use it. I have polishes that have a much stronger odor. The first is Enchanted Lagoon. This minty, sea foam green is my favorite of the bunch. I simply love this refreshing color. This is Velvet Lounge. It is a deep, satin purple. The photos pick up more of the blue hues but it is really a gorgeous shade of deep purple. Almost like a crushed velvet. 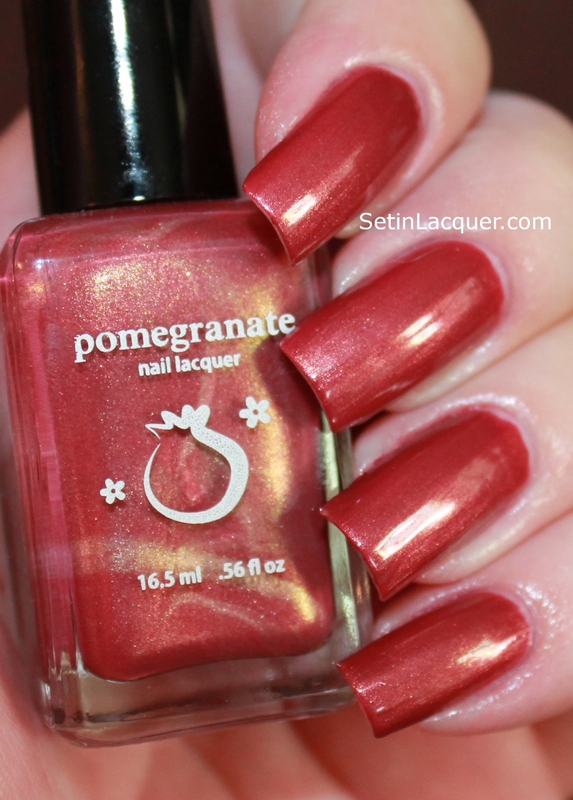 Bottom line: I am going to definitely purchase some more of Pomegranate Lacquers. I can't wait to see the new collections. They have wonderful colors and apply easily.